For other uses, see Gamma (disambiguation). Gamma rays (γ-rays) are electromagnetic waves with the smallest wavelengths in the electromagnetic spectrum. They were discovered in 1900 by Paul Villard, and named in 1903 by Ernest Rutherford. 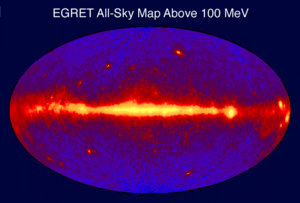 Gamma rays are like x-rays, but the waves are smaller in wavelength. Both gamma rays and x-rays are photons with very high energies, and gamma have even more energy. They are also a type of ionizing radiation. Gamma rays can travel through thicker materials than x-rays can. Gamma rays are produced by some types of radioactive atoms. Cobalt-60 and potassium-40 are two isotopes that emit gamma rays. Cobalt-60 is created in accelerators and is used in hospitals. Potassium-40 occurs naturally. Small amounts of potassium-40 are in all plants and animals. Gamma rays from potassium-40 each have an energy of 1460 thousand electron volts (keV). 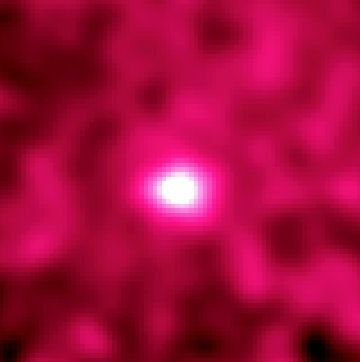 Gamma rays and X-rays can also be distinguished by their origin: X-rays are emitted by electrons outside the nucleus, while gamma rays are emitted by the nucleus. Gamma rays can also go through the skin to kill cells, such as cancerous cells. Doctors can use radiation therapy machines which produce gamma rays in hospitals to treat people with some types of cancer. Doctors also use gamma rays to find disease. In hospitals, doctors can give patients radioactive medicine which emits gamma rays. Doctors can find some types of disease by measuring gamma rays which come from a patient afterward. Hospitals can also use gamma rays to sterilise (clean) things as disinfectants do. Gamma ray Facts for Kids. Kiddle Encyclopedia.